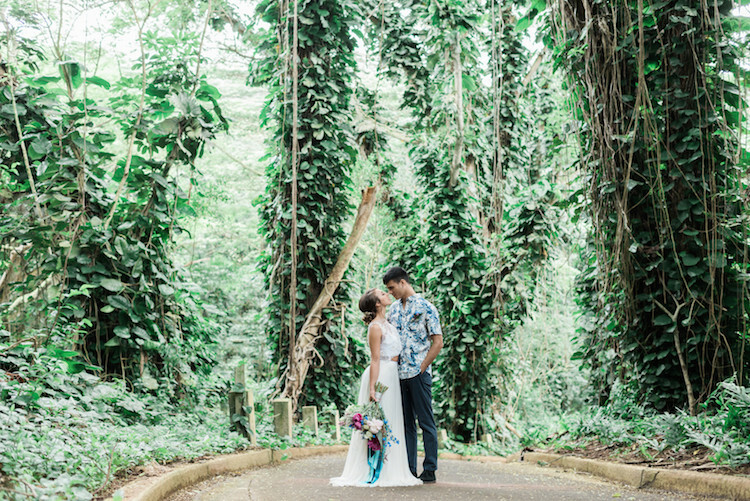 Photographer Rae Marshall brings us today’s refined take on a Hawaii wedding, with a whimsical boho twist! 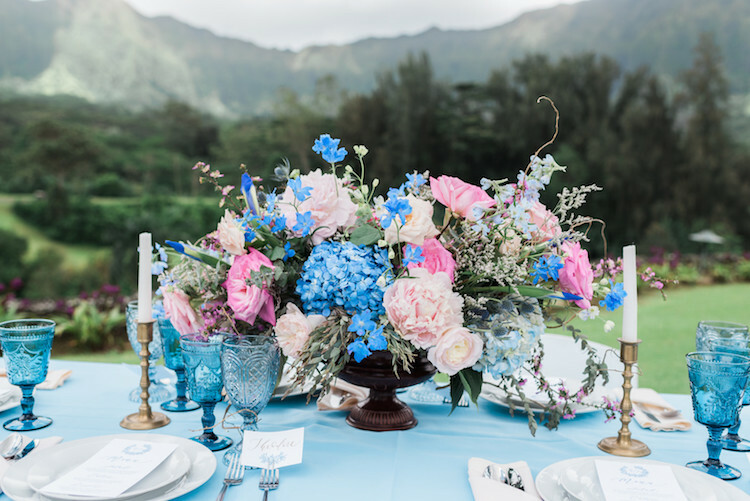 When you think of an Hawaiian wedding, you often think of vibrant colors and beaches with pina coladas – which we totally love! 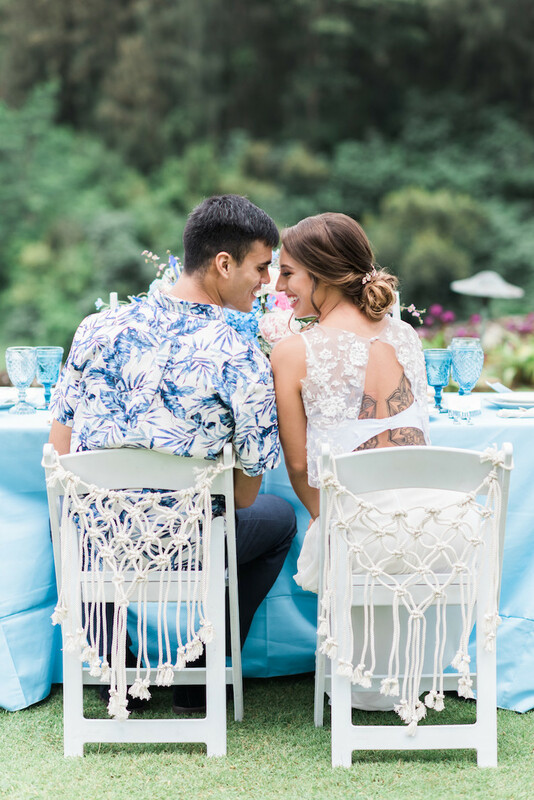 Today instead, however, Rae Marshall and her team of vendors show us their elegant vision of Hawaii wedding style. 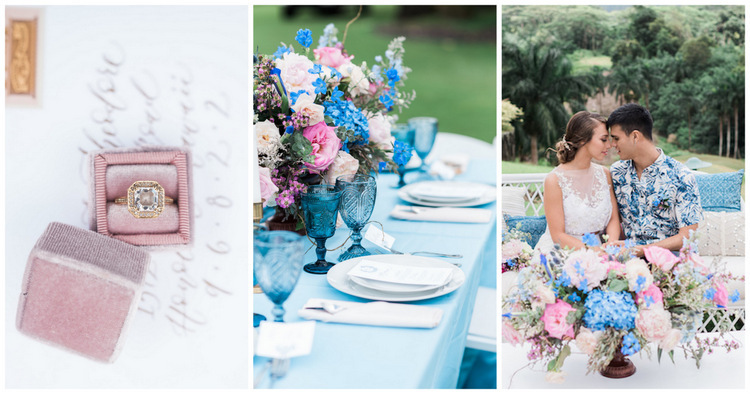 In place of the typically bright, relaxed Hawaiian beach look, they brought to life a classy outdoor wedding affair with refined tones set on a gorgeous tropical golf course. 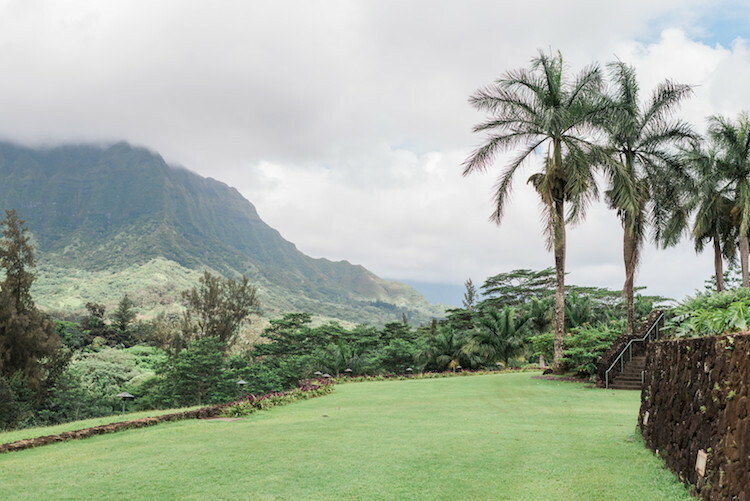 The Royal Hawaiian Golf Club in Kailua on Oahu offered sweeping mountain views, palm trees and lush forests with greenery – perfect for a tropical wedding. 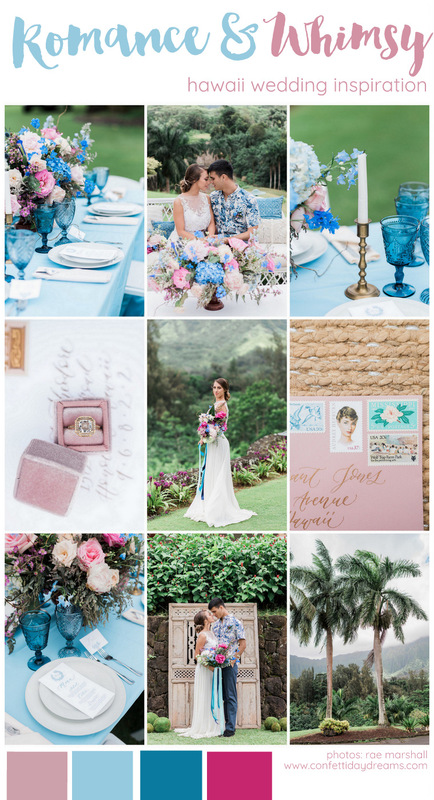 The team worked with a romantic, elegant mix of light and dark blues mixed with blush and magenta pops to showcase cooler tones, complimenting the softer nature of the island. Creative Concepts by Jeff put together a bold, whimsical array of flowers in a mix of blues, pinks and whites. The flowers were romantic and free flowing, including peonies, David Austen garden roses, Japanese Lisianthus, Hydrangea, Misty, Baby Blue eucalyptus, Belladonna delphiniums and more. 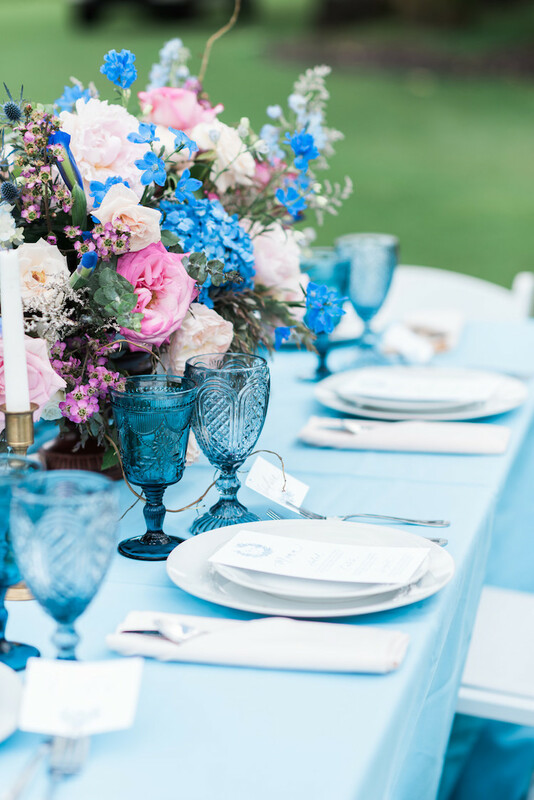 These voluptuous blooms were set on a cheerful outdoor reception table from Accel Rentals, complete with blue drinking glasses and some candles to set the mood. 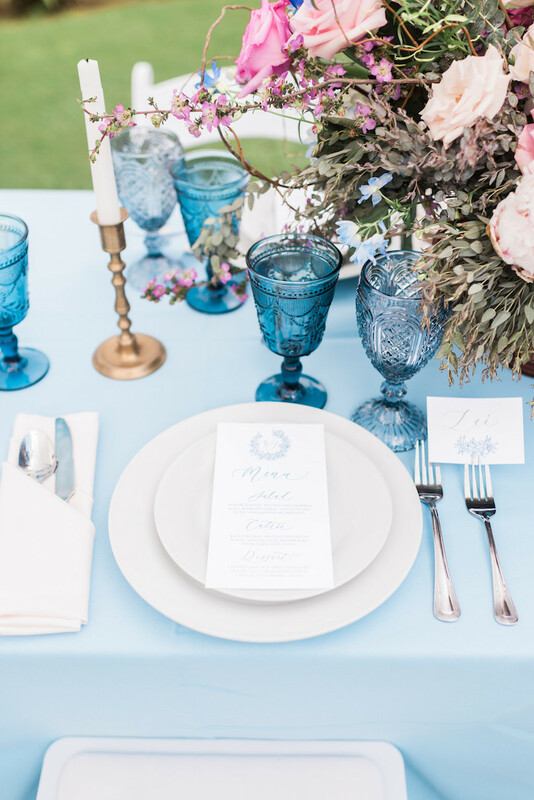 Anna Claire Calligraphy created an elegant set of wedding stationery including an invitation suite and table paper goods in shades of blue and blush. 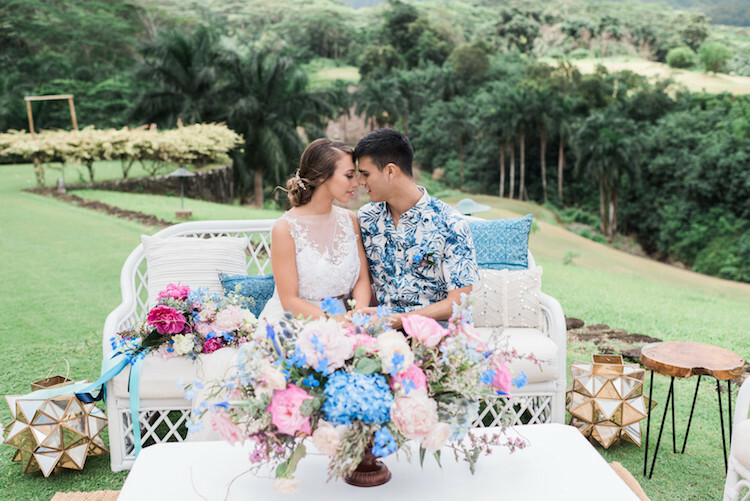 Roam rentals hawaii created a cute seating area with vintage style pillows and white pieces for a mix of elegance and boho for this wedding day. 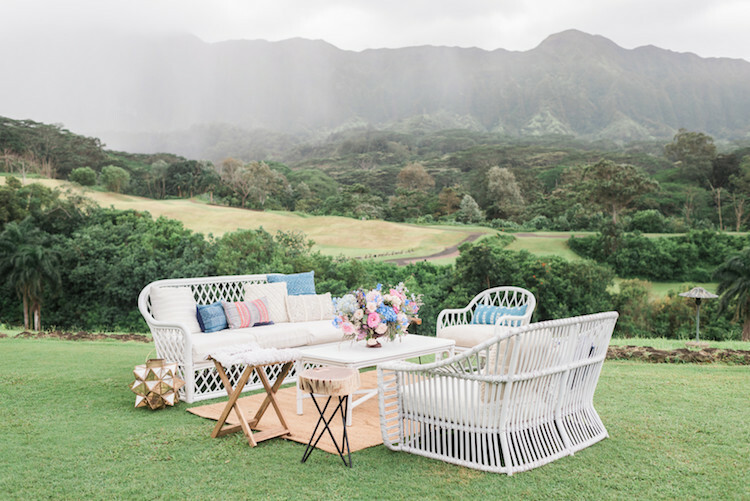 The white peacock chair gave a more classic take on the typically iconic Hawaii-style, fit for an elegant bride. Their vintage door background later a beautiful backdrop for ceremony + photographs. Perfectly Made Hawaii styled soft makeup along with loosely elegant bohemian hair. Peachy tones brought out the brides beautiful green eyes, her hair styled in a loose, low bun with a few strands framing her face, with a beautiful hairpiece. A light, two-piece wedding dress from Gypsy Bride allowed for a whimsical, airy quality of movement for their free spirited and whimsical bride. 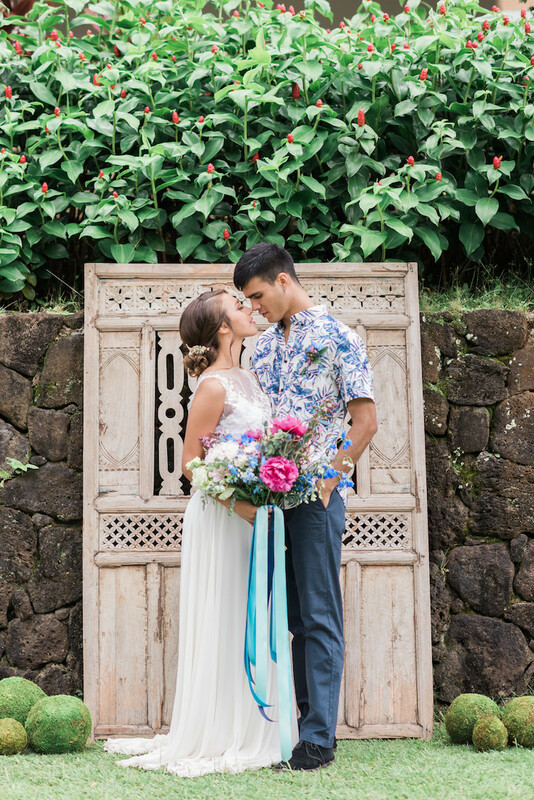 The groom stayed true to proper aloha attire with a fun take on the Hawaiian shirt for his look!